Where will Redick end up? Let us know! 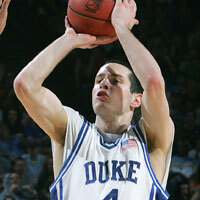 There is not a better shooter in the 2006 NBA Draft than Duke's J.J. Redick. With a pure stroke that must be respected from anywhere on the floor, Redick led the Blue Devils to a 32-4 record, scoring 26.8 points a night on 47% from the floor. Redick, who scored 30 or more points an incredible 14 times as a senior, was named a First Team All-American in 2005 and 2006, the "Player of the Year" by AP and Sporting News and the recipient of the Wooden and Naismith awards. For NBA scouts, shooting ability is not a question with Redick but rather his defensive abilities. Outstanding shooter ... from anywhere. Great range - hit over 42% from long range as a senior and never shot below 39.5% in any of his four years at Duke. Flawless mechanics and a very quick release on his jumper. Money at the charity stripe, where he hit 91.2% for his career. Very good work ethic. Defense. Can J.J. Redick defend guards -- ones or twos -- at the NBA level? He will have to add strength and quickness to manage that. He is not a top athlete by any stretch. He can be streaky with his shot and as LSU showed in the NCAA Tournament, he can be contained. J.J. Redick on the Houston Rockets? Projections are from one end to another on J.J. Redick, ranging from Trajan Langdon (flop) to Jeff Hornacek (sharpshooter) and admittedly it's a tough call. He could be very valuable on a team like Houston with established stars to take the pressure off. While I don't feel J.J. is going to flop, as he is an out-of-this-world shooter, I don't think he would give the Rockets too much more than a Jon Barry currently. Don't get me wrong -- that's not bad... but with a lottery pick, I personally hope the Rockets seek someone who is a better fit athletically on both ends of the floor for today's style of NBA ball.